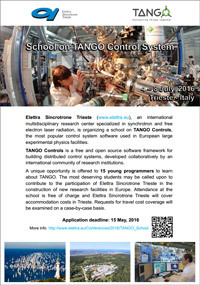 Elettra Sincrotrone Trieste (www.elettra.eu), an international multidisciplinary research center specialized in synchrotron and free electron laser radiation, is organizing a school on TANGO Controls, the most popular control system software used in European large experimental physics facilities. TANGO Controls is a free and open source software framework for building distributed control systems, developed collaboratively by an international community of research institutions (www.tango-controls.org). A unique opportunity is offered to 15 young programmers to learn about TANGO. The most deserving students may be called upon to contribute to the participation of Elettra Sincrotrone Trieste in the construction of new research facilities in Europe. The school will give students a general overview of the TANGO framework and the fundamentals to be able to develop software applications in the TANGO environment. After a brief introduction to control systems in large experimental physics facilities, the students will learn the basics of the TANGO structure and tools, and the elements for developing simple client/server applications. The lessons will be complemented with examples and hands-on exercises using computers equipped with TANGO. The lecturers are engineers with long experience in accelerator control systems and in TANGO software development and management. The lectures will be given in English. Attendance and accommodation costs will be covered by Elettra Sincrotrone Trieste. Requests for travel cost coverage will be examined on a case-by-case basis. The candidates will be selected based on their CV. Class attendance is mandatory. At the end of the school the most deserving students will have the opportunity to attend an additional training period at Elettra.